Swiss luxury watch brand Baume & Mercier enhances its 32mm Linea family of ladies’ watches with new models in Quartz. Introduced in 1987, the sensual Linea line featuring 12 hour markers engraved on the bezel, was an instant hit. It is one of the most versatile collections thanks to its beautifully integrated interchangeable straps. The incredibly easy-to-use interchangeable strap system, and its regularly updated strap color and leather/satin choices, makes this one of the most pleasant-to-wear-everyday watches. 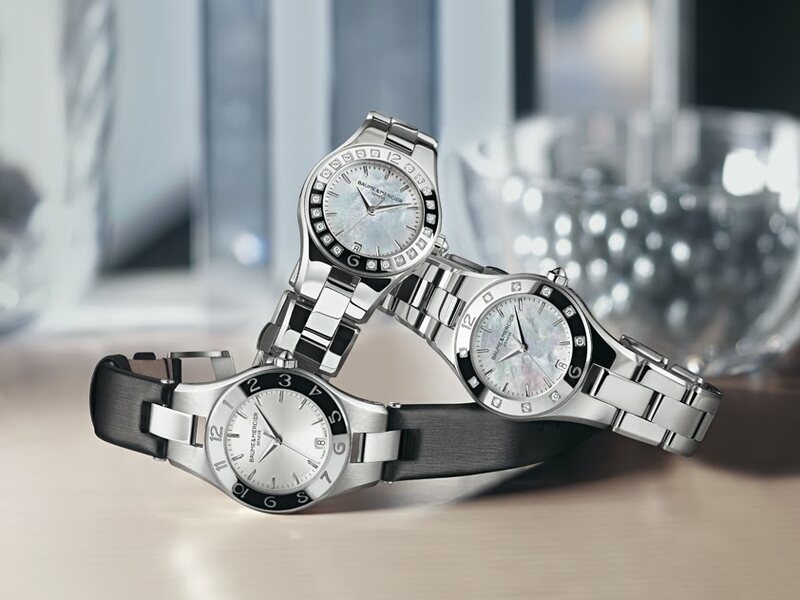 The new 32mm Linea quartz watches, offered in stainless steel, or in two-tone, feature various diamond settings ranging from diamond-adorned dial, to lightly diamond-set case, or a fully bedecked diamond case for ultimate shimmer. This year marks the introduction of a quartz movement in a 32mm Linea stainless steel case that offers hours, minutes and seconds hands. Also new this year is a striking trapezoidal bezel setting that offers even more distinction. These evocative new pieces house a Swiss quartz caliber, with date display at 6:00. Varying degrees of diamonds – from an unset version to a full-set bezel – offer greater choice. Each Linea 32mm quartz watch is artfully created with an alternating polished and satined finish as on the stainless steel case, bezel and bracelet. Each elegantly curved piece features the integrated iconic case-to-bracelet look that offers sleek styling and superb comfort. In addition to the bracelet with triplefolding security clasp, each watch comes with an additional, easily interchangeable black strap –calfskin or satin –with pin buckle to ensure different looks to suit different moods or occasions. Each watch features an engraved bezel, and a scratch-resistant domed sapphire crystal and a caseback with four screws that can possibly be personalized with engraving. The new Linea 32mm quartz watches are water resistant to 5 ATM (approx 50 meters). With its generous curves and harmonious appeal, the entry-price Linea quartz 32mm reference 10070 boasts a silver-colored dial with a combination of sun satin-finished and snailed zones for depth and dimension. It features riveted indexes, is sold with an additional black calfskin strap. The slightly diamond embellished Linea quartz 32mm reference 10071 naturally embodies all of the features and functions of its siblings, but is majestically built with a mother-of-pearl dial with snailed zones and riveted indexes. The case on this piece is elegantly bedecked with 10 diamonds weighing 0.18 carats. The additional strap for this piece is black satin. Sparkling in chic style, the Linea quartz 32mm version 10072 is beautifully equipped with a mother-of-pearl dial with snailed zones and riveted indexes. The case is meticulously set with 22 diamonds weighing 0.34 carats. This model is sold with an additional interchangeable black satin strap with pin buckle.